How many more Japanese photo memes can there be? When will they stop? At this rate, never. In the last 24 hours or so, the above photo has been going viral in Japan. It's been retweeted over eighteen thousand times. On the original tweet, it says in Japanese, "We're sick of guitar!! We want to play Mushiking!" 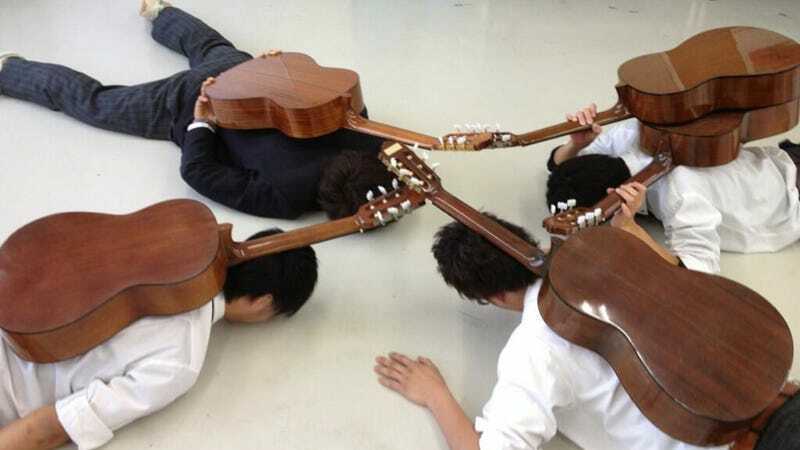 The four students put their guitars on their backs and pretended they were beetles. Mushiking: The King of the Beetles was an originally a Sega arcade and collectible card game in which insects battled. It was very popular in Japan about a while back and even spawned an anime series, an animated feature, and a DS game. Japanese teens, like teens anywhere, like to goof off on the internet. And thus, we get trends like this—trends that sometimes go global. What's interesting about this particular is that the original photo and its catchphrase are spawning parodies. The cultural context means some of the humor is lost in translation. The tweet for above image says, "We're sick of L'Arc-en-Ciel!! Let's play Mushiking!" This one says, "Since there's no Yu Jin, we're tired of being the Five Elite Generals!! Let's play Mushiking!" This meme is, as previously mentioned, just starting to take off. And it's unclear how far it will spread or how many kids will start playing "guitar Mushiking" for internet kicks. In case you missed it, here's a round up of recent Japanese photo memes: Dragon Ball, Harry Potter, and Attack on Titan.